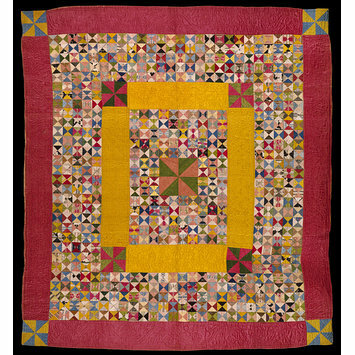 This quilt is said to have been worked by Mary Parker of Crediton for her marriage in 1770. The silks and ribbons of which it is made date from about 1720 to 1750. Quilted patchwork bedcover of plain-weave and complex-weave silks. Most of the silks are ribbons dating from the 1720s to 1740s, including some stamped examples. The triangular patchwork borders are quilted in a linear pattern, and divided by wide borders of yellow and pink silk satin. 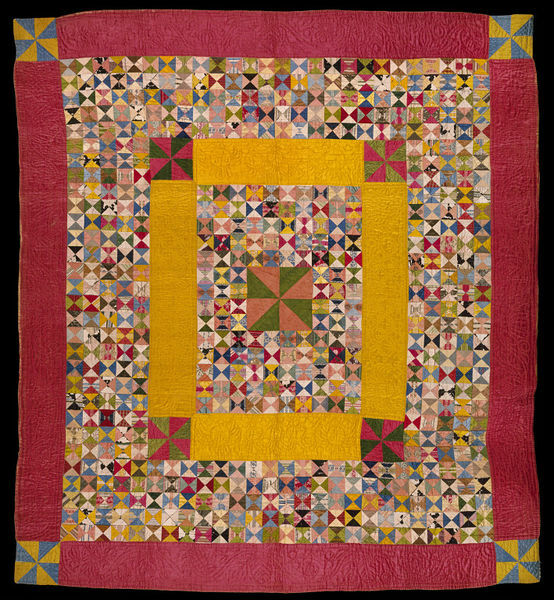 These yellow and pink borders are quilted with a pattern similar to that seen on eighteenth-century petticoats, with a sun-like motif, trailing leaves and flowers. It is wadded with wool and lined with two printed fustians. Some of the paper templates are still intact. Outer border of quilted satin and silks. Meandering stem with flowers and leaves. The patchwork is composed of 2.5 inch squares containing matched opposing triangles. Some of the silks are plain, in greens, blues, yellows, pinks, red, buff, white, grey and black with the latter showing paper underneath. The lining is of two printed cottons, cut and pierced to form nine large rectangles arranged in three rows of three alternating patterns. The piecing suggests these printed materials came from dresses. In the centre and at the four corners is a printed fustian in red and brown with pencilled blue on a white ground. Design of flowers with curving stems and leaves making scroll-edged compartments filled with five different small patterns, floral and geometric fillings. Repeat is approximately 10.5 inches high and approximately 16.25 inches wide including a half-drop repeat. Another printed cotton is printed in two shades of purple and a red on a white ground, and with a design of red stripes patterned by small flowers left in white outline, and crossed by thin meandering stems bearing flowers and leaves in purple and red. The white stripes between the red are filled with tiny leafy stems. The repeat is approximately 8.5 inches by 7.75 inches. Purchased. Registered File number 1987/435. According to the oral history that accompanied this bedcover when it was acquired in 1987, it was made for the marriage of Mary Parker of Crediton in 1770. The textiles used appear to be significantly earlier, but it is possible that they were acquired early in the century and pieced at a later date. The lining is also from the 1730s or 1740s, and may have been recycled from women’s gowns. The maker was thought to be a resident of Crediton, and the ribbons would have been available in the nearby town of Exeter, where highly skilled weavers were producing and trading in silks and ribbons throughout the eighteenth century. Several Parker families were resident in the area at the time. A cream favour with a crown has also been used in several triangles. Favours such as these were created for the coronation and wedding of reigning monarchs, and were a popular means of declaring loyalty through everyday items. Family history associates this bedcover with the marriage of Mary Parker of Crediton around 1770. Yet the textiles appear to be much earlier. The lining may have been recycled from women's gowns, while most of the silks visible are ribbons of the 1720s to 1740s. The ribbons could have been bought in the nearby city of Exeter or from pedlars in the area, while the wool for the wadding would have been obtained locally on Crediton's High Street.